The harbor porpoise is a small cetacean with a robust body and short, blunt beak. Their bodies are very dark on the back, shading to a lighter grey color on the side and white underneath. The dorsal fin is small, broad based and triangular. The mid-section of the harbor porpoise is more stocky and then tapers off towards the tailstock. Harbor porpoises are the smallest cetacean found on the Pacific Coast. They are typically shy and elusive around boats and people. When harbor porpoises surface to breath they do not make a splash or have a large blow. You can see their small slender body, arched back and small dorsal fin as they surface gently through the water. You can see some surface behaviors and splashing if they are hunting and feeding. From shore you can see them quickly surface, with just the small body and the dorsal fin visible. If it is a calm and quiet day you can hear their exhalations as they come to the surface to breathe. Harbor porpoises live in near coastal shallow waters and around the Pacific Northwest. They can be seen from all sites, year round, along The Whale Trail in Puget Sound, the Strait of Georgia and the Strait of Juan de Fuca. There are three populations of harbor porpoises: the North Pacific, the North Atlantic, and Black Sea. They live in near coastal shallow waters and around the Pacific Northwest, harbor porpoises can be seen from all sites along The Whale Trail in Puget Sound, the Strait of Georgia and the Strait of Juan de Fuca. They do not migrate and can be found in the Salish Sea year-round. 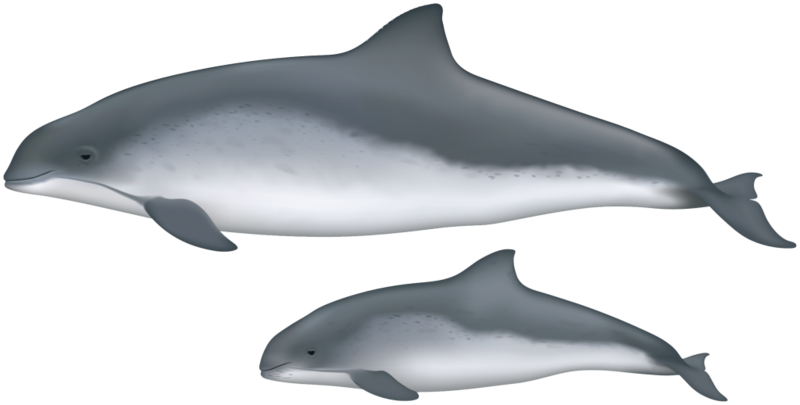 Harbor porpoises display sexual dimorphism, meaning the females are slightly larger than males. They eat small non-spiny fish such as herring, cod, whiting, capelin, squid, pollock, and sardines. They require large amounts of food and need to consume close to 10% of its body weight each day. Harbor porpoise feed on prey that is concentrated in strong tides and rip lines. Harbor porpoises reach sexual maturity between 3-4 years of age and females can give birth once a year for several years. The gestation period, how long females are pregnant for, is thought to be about 10-11 months. The calves will nurse for 8-12 months and are usually born from May to September. It is thought that harbor porpoises are not very social animals with minimal social structure. There is little known so far, however, there are research efforts to photo identify individual harbor porpoises using different identification marks to better understand the social structure. They are usually found solo, in pairs, a mother with calf, or in small groups of up to ten individuals. However, they have been seen actively feeding in large groups of 50-100 harbor porpoises. Harbor porpoises were seen often in the 1940s, which a significant decrease in sightings in the 1970s, followed by an increase in the 2000s. Harbor porpoises populations are rebounding since the whaling industry, however, the populations are not what they were before being hunted. In 2003, Canada listed harbor porpoises under “Special Concern” because they are sensitive to human activities, often become entangled in fishing nets, and sensitive to noise and other impacts in more urbanized areas. They are protected in the United States under the Marine Mammal Protection Act of 1972. The biggest threat to harbor porpoises is “bycatch”, or accidentally being caught in gill nets and trawls. Special precautions have been put in place to reduce bycatch. Another threat facing the species is destruction of habitat by coastal development, as they are usually found near coastal in shallow waters. Vessel traffic, contaminants in the water and in their prey, as well as being preyed on by transient orcas and sharks, all contribute to their threats as a species. Harbor porpoise stranding have also increased since 2005, due to various reasons.